Fans of Frank Capra’s film It’s a Wonderful Life will recall with distaste the conniving banker Mr. Potter, the richest and meanest man in Bedford Falls. George Bailey, played by James Stewart, falls afoul of Potter and is driven to the edge of suicide on Christmas Eve, saved only by the intervention of Clarence, his guardian angel. Potter, or Henry F. Potter to give him his full fictitious name, occupies slot #6 on the American Film Institute‘s list of the 50 Greatest Villains in American film history. People just don’t like him. This scene, where George Bailey confronts Potter, could be a post-2008 parable of our time. So it was with some ambivalence I read that Nationstar, one of the biggest nonbank mortgage servicers in the US and whose name is associated with mortgage crisis, distressed loans and foreclosures, is creating a new brand with the name “Mr. Cooper”. Mr. Potter? Mr. Cooper? Mortgages? Haven’t I seen this movie before? The rebranding comes as the company, which grew into a niche borne of the massive rise in distressed mortgages, adapts to a shifting industry. As the housing market recovers Nationstar needs new ways to grow, especially after a difficult year that saw the departure of several senior executives and a 60 percent fall in the stock price. President and CEO Jay Bray said making existing customers happy is a top priority. So building a recognizable digital-savvy brand that will attract customers for life is a logical step forward. “Mr. Cooper is meant to be that advocate that person that’s going to connect with the customers to deliver best — better experience and to be an advocate for them day in and day out,” Jay Bray said on an earnings call. Nationstar will be well shut of a tired, generic corporate name that is lost in the Landstar, Ameristar, Coinstar morass of sameness and, it’s true, personal names have worked well in the financial services industry in which service should be the operative word. The names of Messrs. Wells and Fargo have served the bank well since 1852, and J.P. Morgan, Edward Jones and Charles Schwab built financial empires on their personal credibility. Charles Schwab’s “Talk to Chuck” campaign in 2005 was a great way of capitalizing on the personal integrity and acumen of an individual, also signaling there was a real person on the end of the phone to talk to for advice, if not Chuck himself. But, like Mr. Potter of Bedford Falls, Mr. Cooper is a fiction. We are invited to relate to a man who doesn’t exist. Who is he? What does he stand for? What does he look like? Maybe the company will invent a Colonel Sanders-type spokesperson to give the brand flesh and blood substance. Even the Colonel was real, though. Given the artificial, digital nature of the brand, Max Headroom might be a better avatar (remember him?). The world is changing around Nationstar and its ilk and it presents a seminal opportunity for them to reinvent what it means to be a mortgage company in the age of digital brands and heightened customer expectation. It had to do something. Mr. Cooper feels lamely traditional and superficial in comparison. It has the hallmarks of a campaign developed by a new age ad agency. And all ad campaigns are, by their nature, transient. The intention for the brand is not entirely clear. News has leaked out in dribs and drabs. It could part of an Allstate/Esurance strategy allowing Nationstar to hedge its bets for a while. Whatever the intention, Mr. Cooper needs more than a “digital-savvy brand”. He needs to be given life. The Oscars are upon us again. Will Leonardo DiCaprio finally take home the coveted statuette for his role in the dreary “The Revenant” or will “Brooklyn” steal the limelight, as I suspect it will? Regardless, the burning question for Namedropper is the identity of Oscar. Who was Oscar? Officially, the statuette is called the Academy Award of Merit, but everyone in Hollywood has known it as Oscar since at least 1934. The Academy itself adopted the nickname in 1939. The most likely story is that when the Academy’s librarian, Margaret Herrick, first saw the statuette, she said it looked like her Uncle Oscar. There were other claims to the name at the time – including the rumor that Bette Davis had named it after her first husband, Harmon Oscar Nelson – but whatever its uncertain provenance, it was to stick as firmly as superglue. The BBC goes into the history of the awards and the story of Oscar here. IS BRITAIN READY FOR A CLEGG? Cleggmania is sweeping Britain. On the basis of his performance in the first two televised debates between the three political party leaders, Nick Clegg is the new golden boy of British politics. People are talking of him as the leader Britain needs. Most watchers of the debates — the first in British electoral history — scored the contests as a surprise victory for Nick Clegg, leader of the Liberal Democrats, over Prime Minister Gordon Brown and Conservative leader David Cameron. Expenses scandals have left electors deeply contemptuous of parliamentarians. Clegg, as the outsider, managed to convince the audience that he was one of them and not part of a cozy old political machine. His big problem is his name. Clegg. Britain has come a long way from the noblesse oblige era of aristocratic, Eton-educated political leaders, but not quite far enough for the Cleggs, I fear. It was a sure sign of the times when the Right Honourable Anthony Neil Wedgwood Benn, 2nd Viscount Stansgate, renounced his peerage in the Sixties and reinvented himself as man-of-the-people ‘Tony Benn’ to pursue a career in British politics. It was said he had his shirt collars specially frayed at Harrods for the role. And Eton-educated* Anthony Charles Lynton Blair led ‘New Labour’ out of the political wilderness as plain Tony Blair. But Nick Clegg has no where else to go. What’s wrong with Clegg might not be apparent to America ears, but to the British there is plenty wrong with it, although people probably wouldn’t say as much. 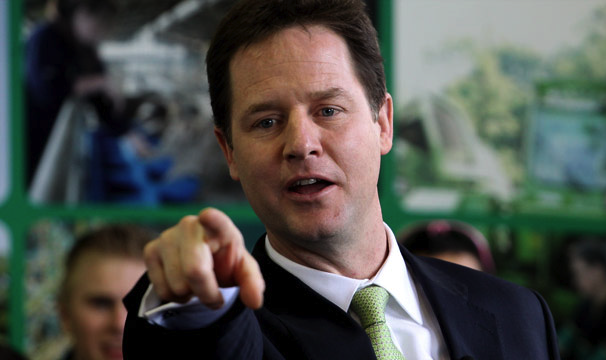 Clegg is brass-necked working class, a clunkingly Anglo-Saxon, irredeemably Northern, below the salt name. Clegg is, in fact, one of the oldest Anglo-Saxon surnames on record, pre-Domesday Book and all that, but it doesn’t count for much in modern Britain. Clegg would be the name of the dunderhead in a TV sitcom, or the feckless foot soldier in a Shakespeare historical drama. “Let him take what he is able to take”. *Tony Blair was educated Fettes College and not Eton. I am indebted to Alan Stephen for pointing out the error.